NotedCareers pride to inspire talents and leaders in Australia to realise their potentials, unlock their career prospects, improve their personal lives and promote a positive change in industry and society. Following our vision, we commit to preparing students at their earliest time for their transition to the workforce. Also, it is essential for students to clarify their career direction and develop an essential blend of the right attitude, professional behaviours and high-level interpersonal skills before their graduation. In short, students are young future leaders. We, hence, thrive to equip them with the right tools and techniques besides their qualifications to establish their career journey and transform to aspiring leaders. NotedCareers share the strong synergy with Melbourne Business School Student Association (MBSSA). Our agreed objective, accordingly, is to provide professional development opportunities to all students at Melbourne Business School, the University of Melbourne. Therefore, the partnership between NotedCareers and MBSSA aims to create an interactive platform for students. The platform, in detail, is to provide access to latest updates on essential skill developments, current Australian job market, recruitment process, employment prospects and broaden their professional network. 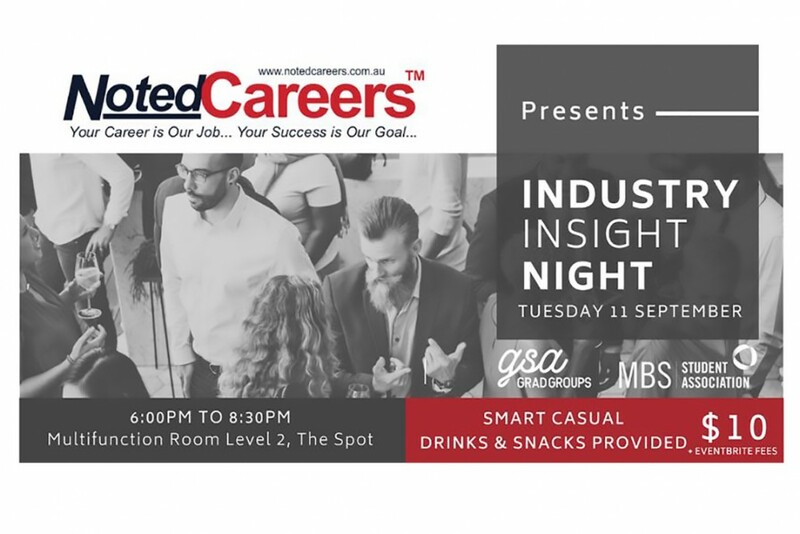 NotedCareers proudly support MBSSA to present Industry Insight Night on Tuesday (11 September 2018) at 6pm at Multifunction room, level 2, The Spot, 198 Berkeley Street, Carlton, VIC 3053. This is an opportunity to engage with a range of industry experts from Marketing, Consulting, Finance and Management. The event will start with a panel discussion and continue to an open networking session. There will be 5 panellists including NotedCareers principal career manager sharing their industry knowledge, experience and workplace insights during the night. So, why should I attend?